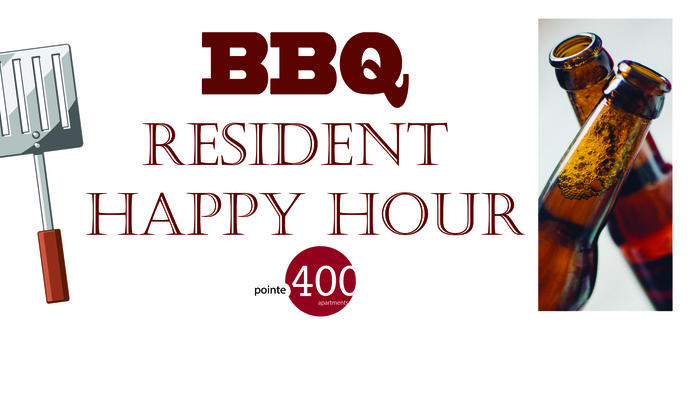 Residents, join us for our special BBQ Resident Happy Hour, Saturday, June 16th from 2:00 p.m. to 4:00 p.m. in the Clubroom. Chef Sacha Quernheim of Red Zucchini PCS will prepare Brats, Grilled Chicken Tenders with a sweet glaze, Salad & a Baked Potato Bar (with Bacon, Sour Cream, Cheese, Tomatoes and Scallions). Pointe 400 will provide a selection of Craft Beers. See you there!